Editor’s note: This is a guest post by Faisal Hoque. Faisal is the founder of SHADOKA, and the author of The Power of Convergence. As a former senior executive at GE and other multi-nationals, Faisal is an internationally known entrepreneur and thought leader. He has written five management books and become a leading authority on business and technology convergence, innovation, and sustainable growth. From decision making roles at multinational Fortune 500 companies to my own startup successes and failures, along with a personal journey of overcoming obstacles and events beyond my control, my life has been a series of ups and downs. It’s what we take from both the wins and woes that enables us to best understand how to fend off future failures and sustain success. The one consistent lesson always comes back to people. The right people make you. The wrong people break you. This applies to any enterprise and experience. My former company, BTM Corporation, is an ecosystem comprised of: employees who are partners; customers who take on a partner role for the value they derive; distribution channels and service providers who collaborate with us across multiple verticals; and academics who foster knowledge sharing. It’s the best and only policy when communicating with a potential customer, client, colleague, employee, supplier, distributor, contractor, or even an industry rival. And it’s the same policy whether you’re speaking face-to-face, across the board table, or via email, text, video or any social or digital platform. You must be honest with yourself, your audience and your mission. Effective leaders must be honest in order to invoke trust and respect from their team and anyone they encounter. You never know who you will have to rely on or turn to in the future. Nobody forgets and forgives dishonesty. Direct communication leads to direction, meaning the path you set as a leader. Nobody wants to follow someone with a muddled message. Fast talking will get you nowhere if there’s no thought in your process. Every word must be deliberate and directed. Don’t be tempted to reach out without direction, which can deter, even destroy, your overall agenda. If you can’t say something clearly and directly, don’t say it all. Talk may be cheap, but it can also be worthless if uttered without direction, and even cost you a client, a deal or your whole business. A direct message is priceless. No matter how successful you are, you won’t continue on that golden path if you stop anticipating what’s next. You need to surround yourself with forward-thinkers. A single team member that’s complacent, lazy or rests on his or her laurels can send everyone involved on a downward spiral. Make sure your people are ready for any changes, including the most unexpected, even unprecedented challenges, which have become the norm in a rapidly changing global marketplace and society. People in the most remote parts of the world are looking to the future, and with access to Internet and intelligence that’s transferred immediately and constantly, the little guy lurking where you never thought to look could be tomorrow’s global giant. The most successful leaders are able to inspire and influence everyone from their executive team, employees, customers, clients, partners, investors and people outside of their enterprise and social circle or demographic. Communication is key for inspiration. You have to show people you’re a person, too. Leadership success can quickly inflate egos and alienate people, including those who are most critical to your ongoing ability to survive and thrive. The best and brightest will be toppled if they can’t inspire and influence other people. It takes a dynamic person with a positive, honest, forward-looking attitude to inspire and influence the people involved in building and growing enterprises and communities. Like any community, a healthy business ecosystem must be nurtured to achieve long-term and continual success. As with any secular, social or other organized community, a sustainable ecosystem is the structure you form around your business to get through the bad times and good times. It’s that environment that allows us to partner with differing individuals and groups who bring unique perspectives and skills. All this enables collaboration, whether it’s with your neighbor, your C-suite counterparts or people across the world. This is what I focus on every day within my own company and with everyone I encounter. You must always be open to inviting new people into your extended enterprise. Even the most casual critics of corporate operations know that focus on quarterly earnings is a diversion from the long-term picture, which includes overall health of a company, cash flow and the ability to stay in business and lead the industry for many years to come. In order to strive and thrive in uncertain times, business leaders must always set their sights on the long-term goals and not get trapped touting or turning attention away from the short-term numbers. Success isn’t measured solely by balance sheets, and operating based on quarterly returns or short-term goals isn’t going to work for the long haul. Volatile times can’t be avoided, but you can be ready for any disruptions in the marketplace or your own life with a long-term plan that supports your vision and enables you to bring to market the right products or make the right decisions for your lifelong satisfaction. It doesn’t matter how smart or savvy you are when it comes to technology, product development or any single skill. Nobody succeeds in a silo. Whatever you venture — personal, professional, philanthropic, political or private – you must remember the people involved in and essential to your success. Learn from your own mistakes and mastery, and learn from the people around you: those you admire now and those you may learn from just by listening and respecting enough to communicate with directly and honestly. You never know who you may inspire or influence, or who may inspire and influence you. Today’s stranger may be tomorrow’s partner. 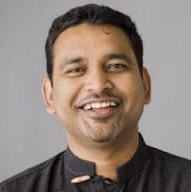 Faisal Hoque is the founder of SHADOKA. You can follow him on twitter @faisal_hoque. Thanks for the post. I work designing online courses and community building is central to making an online class a success. I was cheered to see that you referred to your workplace as an ecosystem; that’s the same language I like to use with our online courses (ala Bronfenbrenner’s Human Development Model). What are some ways that you daily or weekly cultivate community in your workplace? Thanks for your comment and question, Aaron! I’m glad you enjoyed the post. I believe cultivating a sense of community is a continuous process, therefore it’s an ongoing event. For me – and in my company – it has literally become a part of our DNA, so it’s incorporated within everything we do: from new product development or the latest marketing campaigns, to ideas about what the focus of an upcoming event will be from a content standpoint. Ideas from diverse perspectives matter and we’ve found success conducting business from an ecosystem approach. Our team works collaboratively because the cross-functional expertise that we collectively bring to bear results in delivery of a stronger end product/service, etc for our customers. As a designer of online courses, I’m sure you know how important it is to have pride in the final product you create – so I have no doubt this resonates with you. My favorite here is 4. Inspire and Influence. So many times have I seen great leaders create opportunities and results almost out of thin air. It seems so effortless when the influence and ispiration comes naturally. I always look for people who the correct mindset and thinking to be near me, everything becomes som much better then. One of the best posts I’ve read this year. Thank you Faisal.